One day as I was looking for ideas for my destination wedding in Tuscany, I somehow stumbled upon Trouwen in Toscane on Instagram… They sure have gorgeous photos of weddings that they have organized, but I had initial doubts as I knew nothing about them (they didn’t have many reviews) and had no way of vetting them as I live in NYC and a thousand miles away from Florence! I contacted Roos after that to talk about my wedding plans and was immediately impressed by her. I knew right then she would be the one (wedding planner, that is! 🙂 ), and I clearly made the right choice!!! According to her, we were her first non-Dutch clients which I found a bit hard to believe– I suppose other parts of the world have not yet discovered Roos and her team’s talent! 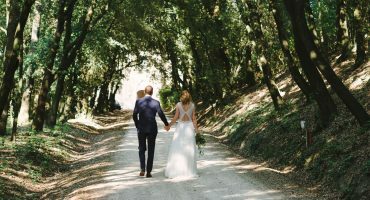 So to those who are looking for a memorable rustic wedding in Tuscany, stop your search for a planner now and call Roos!! Roos is very organized, patient, has a great eye for detail and most of all, has very good taste and sense of style. She will listen to your opinions but is also good in giving advice to manage you. It also helps that her business partner, Sonja, who is the florist, is also a designer. I really hate cookie-cutter weddings and their unique, bespoke, simple and romantic style appealed to me the most. 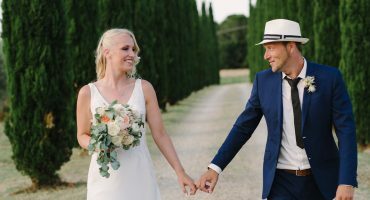 Roos also had very good contacts around Florence/Tuscany area- she picked a breathtaking venue for my wedding, picked the best make-up artist, wedding officiant and music entertainers, and has a great team of people around her- including the official photographer- Milos. 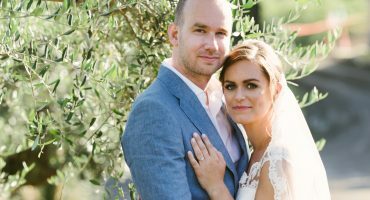 Majority of the stress around my wedding planning was taken away from me because I found Trouwen in Toscane. They are really great at what they do and would definitely not let you down! They are very nice people who clearly love what they do, and it shows! I feel so blessed to have found this team! Could not have imagined how I would have done it without them!